One of my finest pleasures in life right now is watching Fiona bake with her mama. She’s a real natural, I tell ya. Since day one she’s being roaming the flour-laden floors of our kitchen, scouring the dark reaches of bottom drawers and cupboards for new tools. What started out as simply banging pots and pans, quickly evolved into mixing and measuring liquids by the fraction of a teaspoon. A few weeks ago, she was up on her stool rolling out dough, when the rolling pin slipped from the counter and fell to the floor. “Sh*t!” she exclaimed. Both Audrey and I immediately turned to each other in shock, and then proceed to erupt into laughter. Like mother like daughter! Today’s baking adventure, a similarly rowdy family production, is extra special. 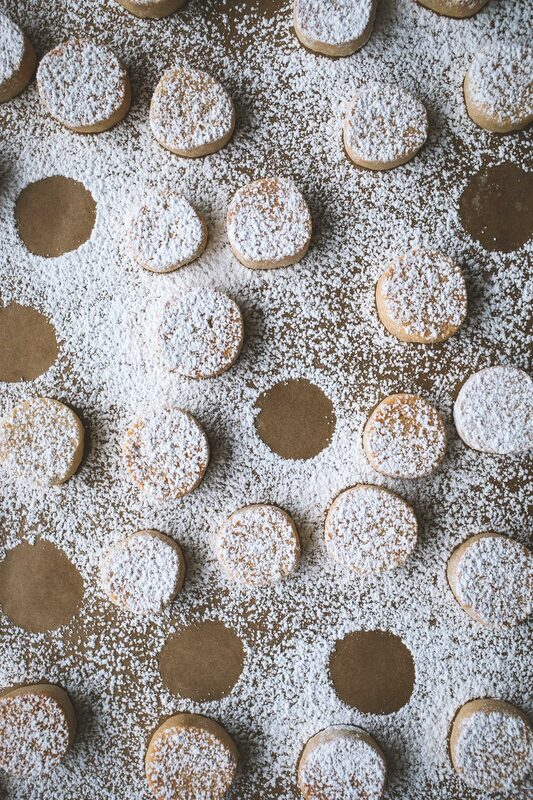 You see, our friends Natalie & Holly from The Modern Proper are hosting a virtual cookie swap! And there’s nothing Fiona likes baking more than cookies (or turkeys, as Fiona calls them). 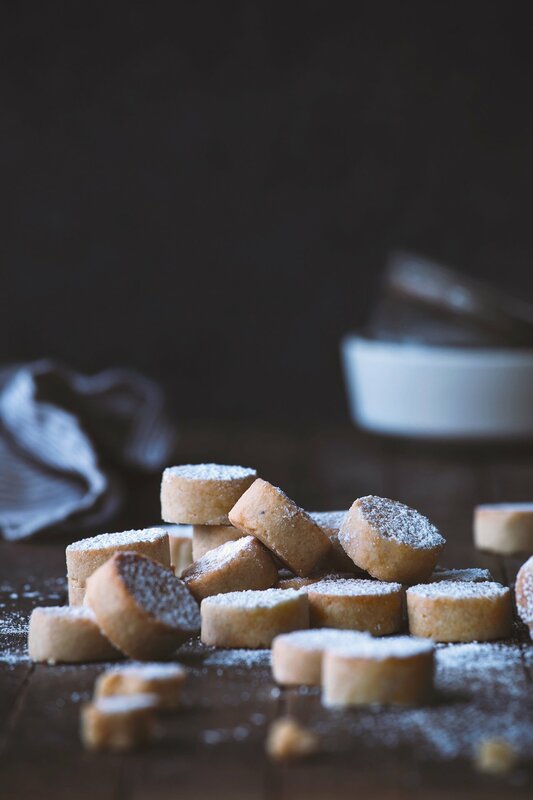 Being the holidays and all, I thought I’d reach back to my roots and share a recipe for ricciarelli, traditional Italian almond cookies, from Siena. This cookie really couldn’t get much simpler. It’s essentially a mix of almond meal, almond paste, and a little egg white to bind (& naturally gluten-free). As expected, Fiona thoroughly enjoyed rolling out the dough, and of course, dusting dousing the finished products with powdered sugar. 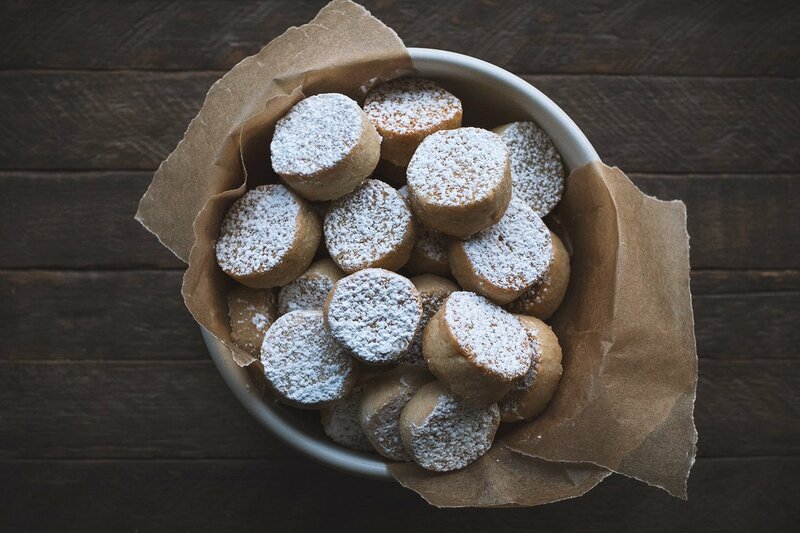 These little joyous bites of almond are perfect for casual holiday snacking. And remember, for more cookie inspiration, be sure to check out The Modern Proper for a full list of all the other delicious cookie swap creations!! Use a food processor to finely grind the almonds. Add the almond paste to a stand mixer fitted with the paddle attachment. Beat on medium-low speed until broken up (~30 seconds). Add the ground almonds and mix until smooth. Add the egg white and turn the speed up to medium. Mix for 2 minutes. At this point the dough should come together and be pretty stiff. Add the vanilla, lemon zest, baking powder, and salt. Mix until just incorporated. Divide the dough into for equal portions and roll each into a ball. Lightly flour your work surface (use almond flour if keeping gluten-free). Using your finger tips, lightly roll out each ball into a log, about 1 inch in diameter. Wrap each log in plastic wrap and refrigerate until firm, about 1 hour. Preheat the oven to 300° F. Line two baking sheets with parchment paper. Remove the logs of dough from the refrigerator and slice into 1/2 inch thick rounds. 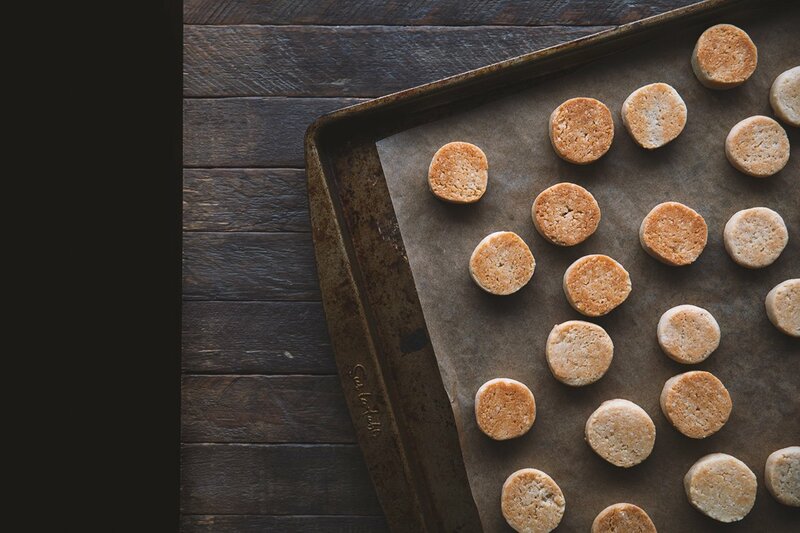 Arrange on the baking sheets, keeping at least an inch between each cookie. Place the cookies in the oven and bake for about 15-20 minutes, or until golden, rotating the pans halfway through. Transfer the baking sheets to a wire rack to cool. 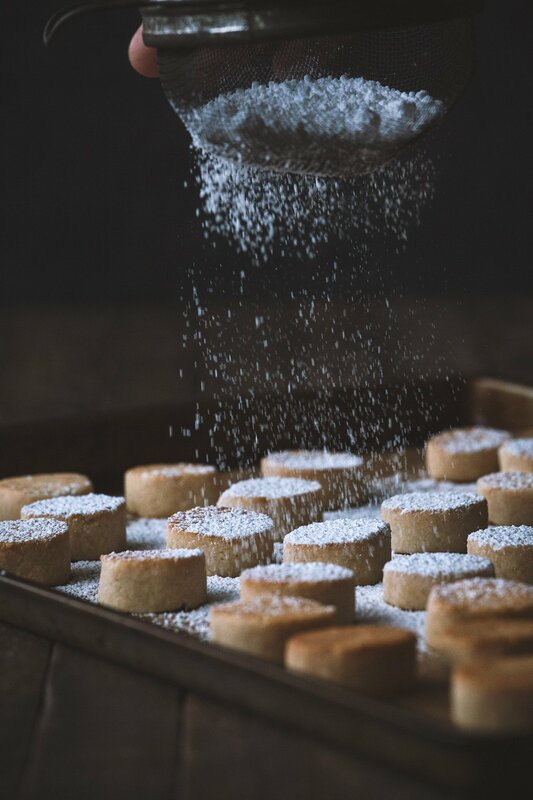 Dust with powdered sugar, and serve! Cookies can be stored at room temperature in an airtight container for up to a week. Any extra dough can be frozen for up to a month. Perfection at it’s peak ! Happy to find you ! I wish you have a happy and prosperous 2017 ! How much almond paste is that in cups? Yay!! That’s so happy to hear, Arden. I needed a bit of cheer today 🙂 These moments are truly unforgettable! Happy holidays to you too!! I love how fat and cute these cookies are! And the flavor combo, almond cookies are one my all-time faves. Also, that story about Fiona cursing during baking is too much, haha! Greetings! I work on publicity for The Perfect Puree of Napa Valley. We really admire your site and your Instagram feed and we’d love to send you a sample of the Ginger Sour flavor being released soon. Could you provide a a physical address and phone number for delivery purposes? Thank you! 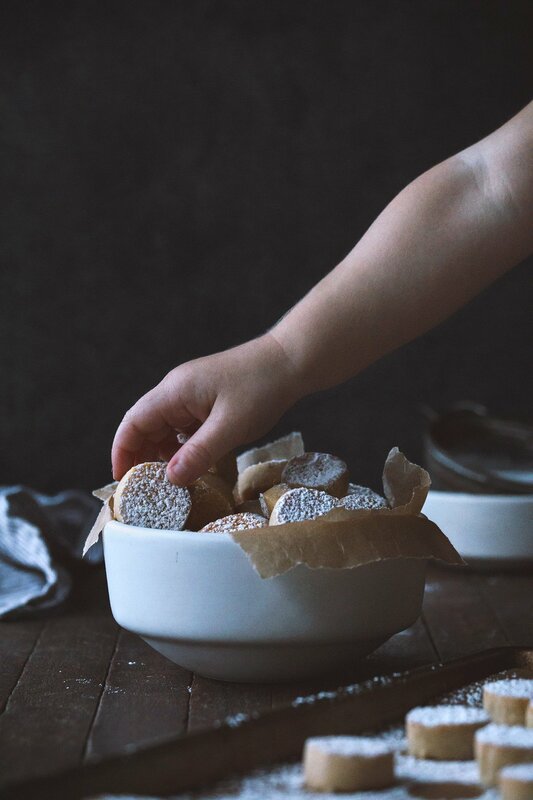 The best part is all the beautiful memories Fiona will have of baking with her mama when she grows up. I have fond memories of cooking with my mom as well and it’s a great gift for kids, I think. This is my kind of cookie! Will definitely be making these! Thank you Heather! She’s the CUTEST!! Definitely a future master baker. These are absolute perfection. I love almond cookies and actually make them often. Their texture is so satisfying and I love their deep almond flavor. Love the added almond paste…I could eat that stuff with a spoon. I love reading about your daughter’s love of baking…precious! Thank you Caroline! 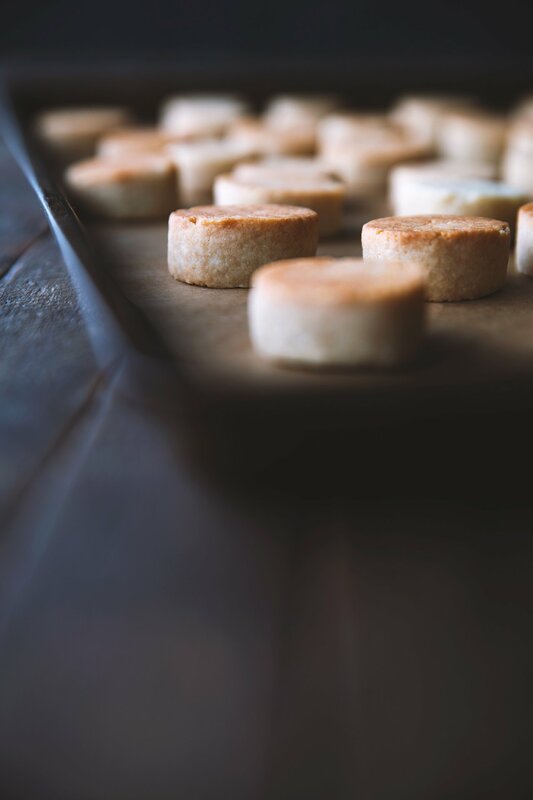 What type of almond cookies do you usually make? they look absolutely amazing!!!! I’ve never had these before, but they look so perfect and I’d swap with you for these in a heart beat! my absolute favorite cookie, ever!!! Thank you so much for sharing this recipe. We fell in love with these cookies when we were in Siena years ago. I always scour the shelves of Italian markets looking for them – now I can bake them myself! I’ve never had one before, but they look delicious! Love the photos, as always.